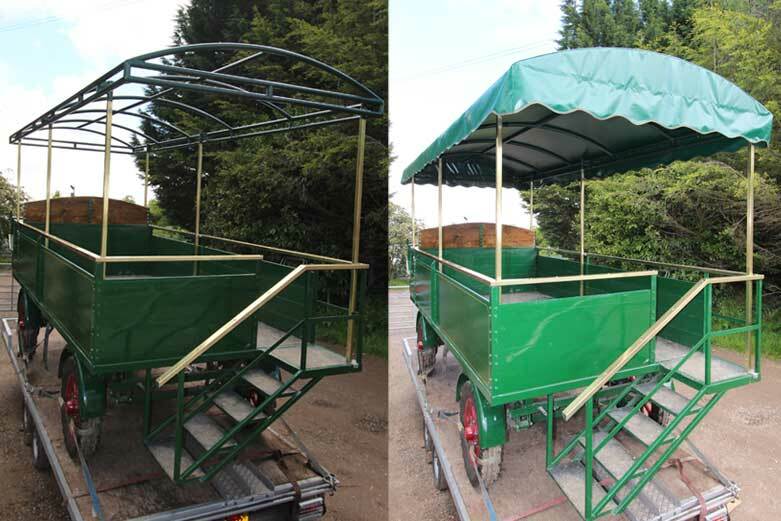 Recently Kover-it recovered a canopy on this cart which is used a lot around countryside’s, and is pulled by horses. 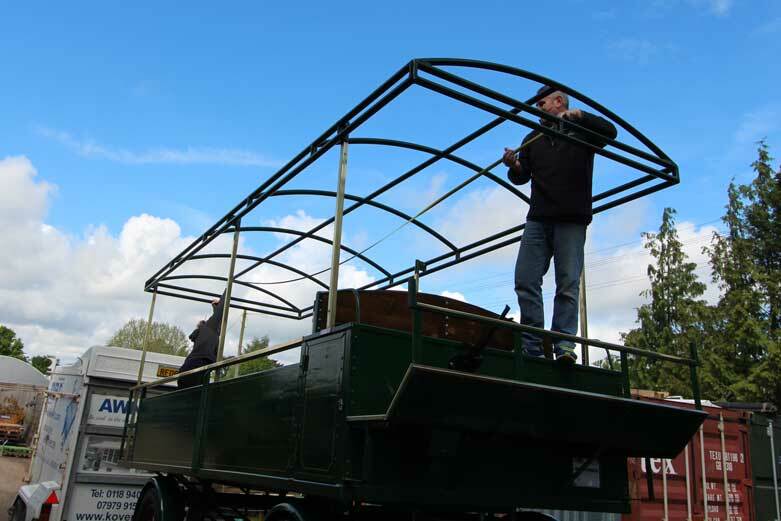 The horse drawn cart was dropped off to us early in the morning and the canopy was manufactured and fitted ready for the cart to be picked up in the late afternoon. By doing this, we could measure the cart and manufacture a very well fitting canopy, and if we needed to make any amendments we could do so. 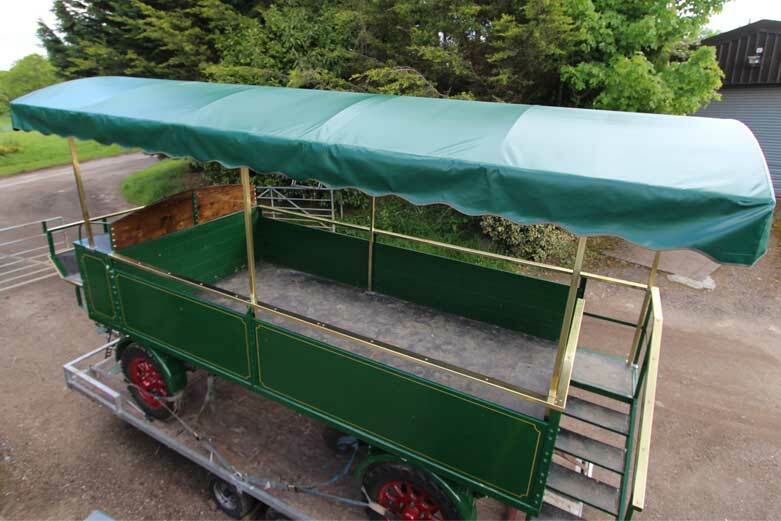 Below is a picture of the Cart before the canopy was fitted. You can see Kover-it’s skilled machinists measuring the structure to ensure a good fitting cover is made. We recovered the Cart Canopy in PVC-ST, which is an immensely strong and durable textile, so strong that the same textile is used for lorry side curtains. Also completely waterproof, the textile is ideal for situations where it is exposed to strong winds, harsh rains, and is used all year round. Because PVC-ST is a thermoplastic, it can cope in extreme temperatures of up to plus 70 and minus 30 without shrinking, blistering or changing shape. This means it is perfect for use on the cart where it can be exposed to the beating sun in the hot summers, and the extreme cold and rainy temperatures in the harsh winters. Predominantly the cart is used for several months of the year at tourist attractions and events, the canopy offers people of all ages shade from the Sun, and shelter from the rain. In addition to this, at a later date side curtains could be added to the cart to offer shelter from the wind and cold. 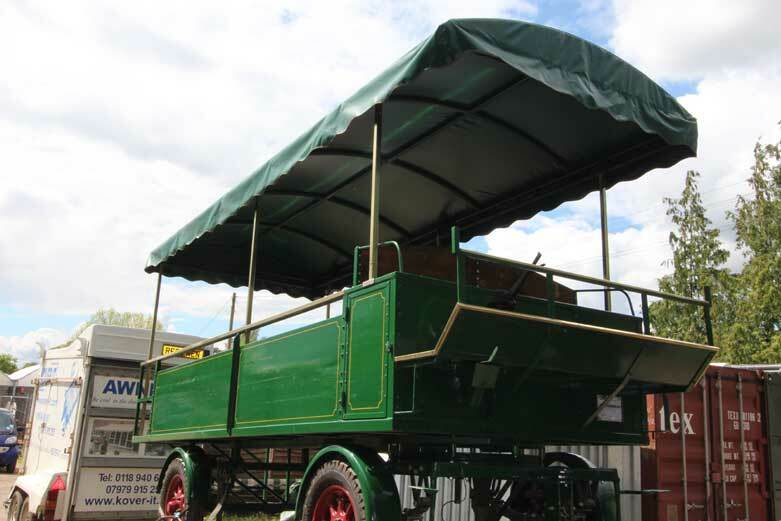 The Horse and Cart gets a lot of attention, therefore it is very important that the canopy adds to its aesthetics, improving the overall look as well as function of the cart. The Dark Green PVC-ST canopy certainly adds to its pleasing cosmetic looks, the green keeps it looking very natural and blending with the cart and its countryside environment. Below are some images before and after the canopy was recovered. 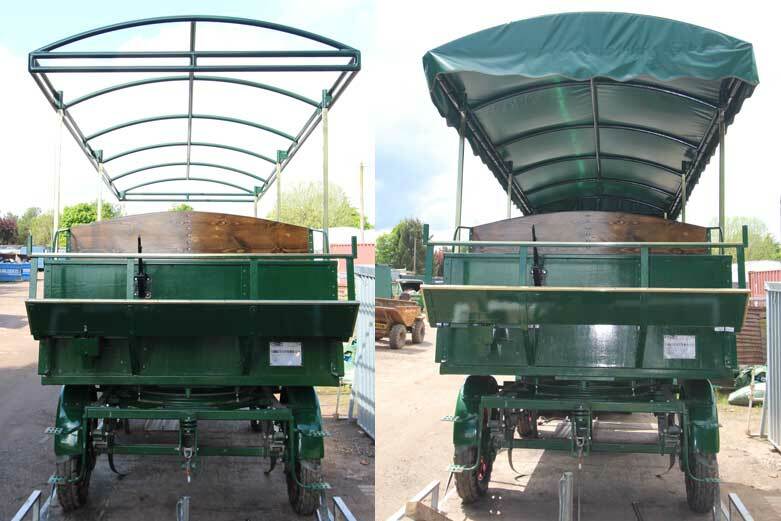 As the canopy is on a horse drawn cart inevitably it will be prone to getting dusty and dirty, however the cart canopy is very easy to clean. To start with, the textile is less likely to get as dusty as other canopy materials such as acrylic, as the PVC-ST is smooth and dust doesn’t cling to the fibres like it does with more fabric textiles, this means the dust can be easily washed off without scrubbing. The textile is wipe cleanable, and most of the dirt and dust will be washed away in the rain, so by leaving it out in heavy rains helps do most of the work. As you can see the cover is pulled drum tight over the structure, and shock cord is used to secure the canopy in place. The shock cord is laced through all of the eyelets and around the entire of the metal bar, Velcro is also used to wrap around the bars for extra security. Attaching the canopy this way means it is not damaging the carts structure and can be removed if necessary. 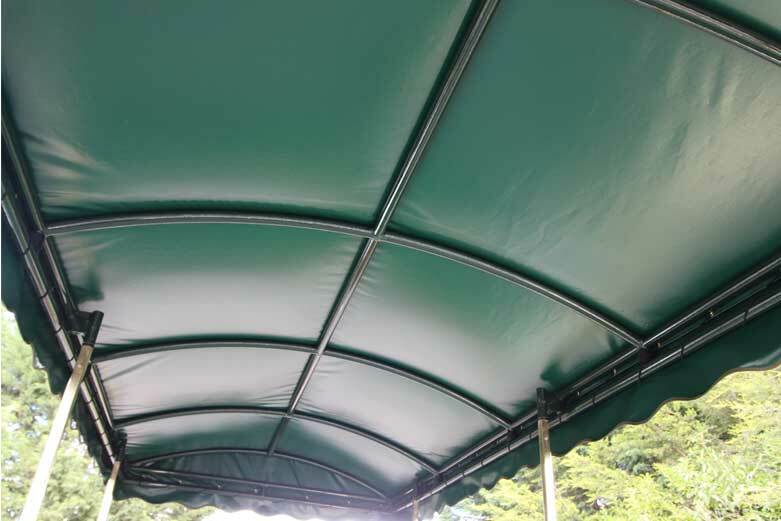 The customer also chose to have the scalloped edge which gives the canopy a decorative finish; these are freefalling and can move in the wind. The edge has a dark green trim, and alike all of Kover-it’s canopy’s and covers, has a high quality feel and look even in the smallest of details. 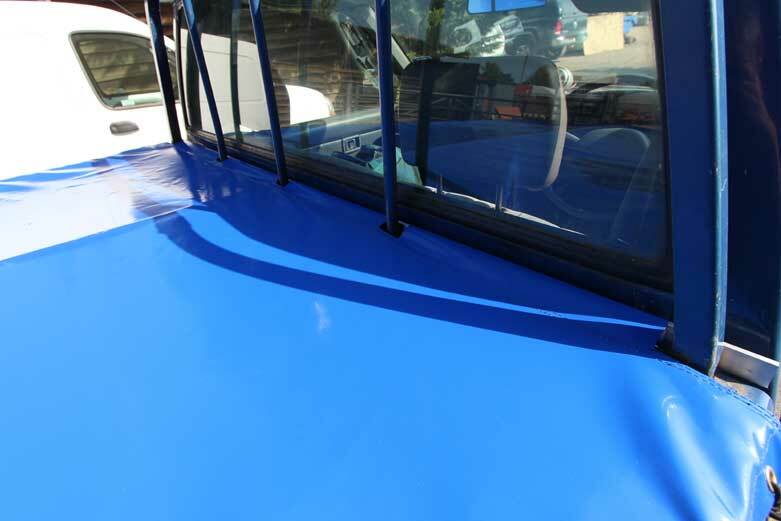 Because PVC-ST is such a durable, strong textile, it is used a lot in the commercial industry, and we use it alot on other vehicles such as for truck and trailer covers. Below are some other covers we have manufactured. This blue PVC-ST cover is very easy to put on and off of the trailer. There is a pocket in the cover for a metal baton which is put through the pocket when the cover is in use; this keeps the cover secure where it meets the front. Around the trailer there are metal hooks which the shock cord is easily hooked underneath, and since it has elasticity this makes it easy to secure. The shock cord can be adjusted to make it tighter or looser, this means if there is a tall load and the cover will ride up a bit it can still be secured and will protect the goods. Just like the canopy on the cart, covers on vehicles are more prone to getting dusty and dirty, but the PVC-ST is very easy to clean. It can be wiped clean, and most of the time heavy rain will do most of the work for you. As you can see the blue looks very cosmetically pleasing, and the customer was very pleased with the cover. 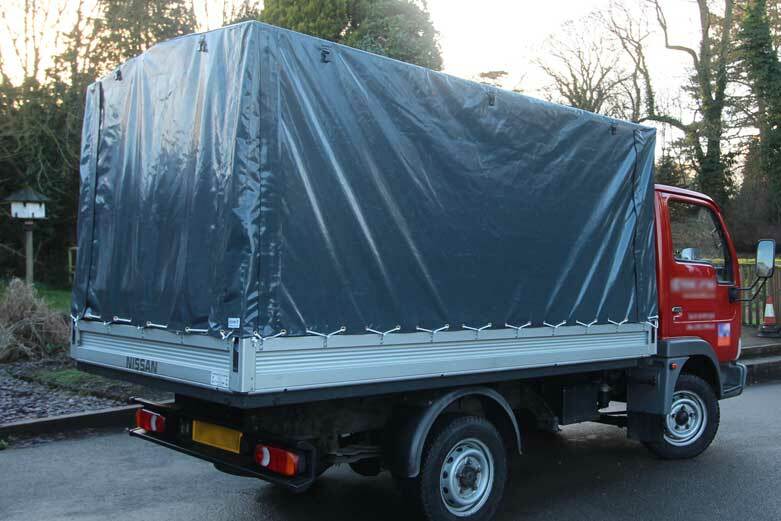 Below is the truck cover we manufactured which is secured to a metal frame underneath. 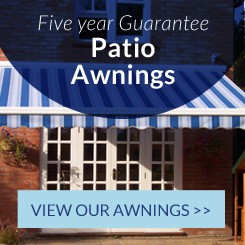 The cover keeps its load dry and protected, and the load can be conveniently accessed by both sides. The sides have large panels which can easily be rolled up and attached by the clips. 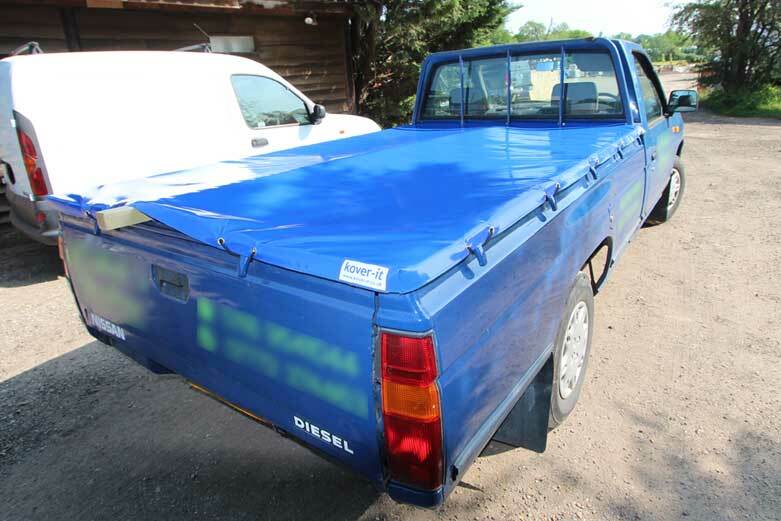 Just as with the blue trailer cover, it is easily secured by the shock cord which is hooked under each metal hook around the truck. 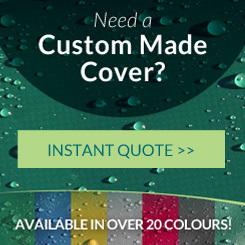 As you can see Kover-it prides itself on manufacturing very high qaulity good fitting covers, and if you would like a bespoke made cover you can send an enquiry in by our website page. Or you can give us a call on 01189 406095, for covers such as the ones above the customer was able to book a day when they could bring the vehicle in for us.